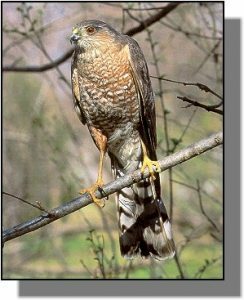 Comments: Sharp-shinned hawks are robin-sized birds with bluish gray backs, rufous barred chests and a square tail with a narrow white band at the tip. Adults have red eyes. Sharpshins are strongly dimorphic in size with the females much larger than the males. Distribution: The North American subspecies A. s. velox is found from Alaska, through Canada and into the southern United States. It is not a common bird in Kansas but can occasionally be found wherever there are wooded areas and small birds. There are a few records of nesting in northeast Kansas. Food: Sharp-shinned hawks prey almost exclusively on small birds. They sometimes stakeout backyard bird feeders. They may hunt from an inconspicuous perch or by short low level flights to surprise and flush small birds from cover. Occasionally they will eat small mammals, amphibians and insects.